Homeschooling a wide range of children can be challenging. That's why we often find that online resources with a variety of tools for kids K-12 quickly become some of our favorites. 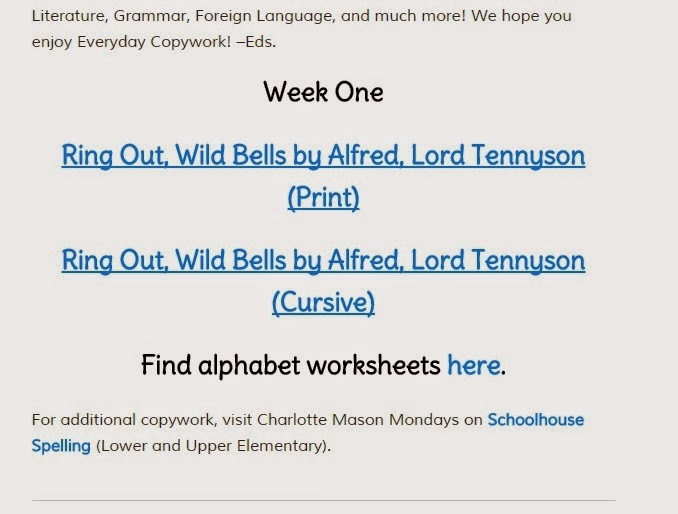 This week, we are sharing what we thought of SchoolhouseTeachers.com, an online site designed to make lesson planning and teaching simple for home educators of all grade levels. We were given a yearly membership to help us discover all the ins and outs of the site, which I'll be detailing below. Quite simply, it's a portal of classes and computer-based homeschool curriculum that parents can use to supplement their existing course curriculum choices OR act as standalone coursework. Many of the courses are available to download and/or print, and some include video components. The range of grades is K-12, with most all "core" subjects covered, as well as many extra-curriculars. I had been a member of SchoolhouseTeachers.com for a year prior to getting another year through Schoolhouse Review Crew, so I was pretty familiar with all the options. We had 9th grade student who was a bit behind in her math, and we didn't feel comfortable using a boxed math curriculum until I was certain she had been caught up. We went through the Pre-Algebra course according to the plan on the site, and she was at grade level in no time. We also had her take a few extra-curriculars during the summer to stay sharp and get in the habit of doing more written work. 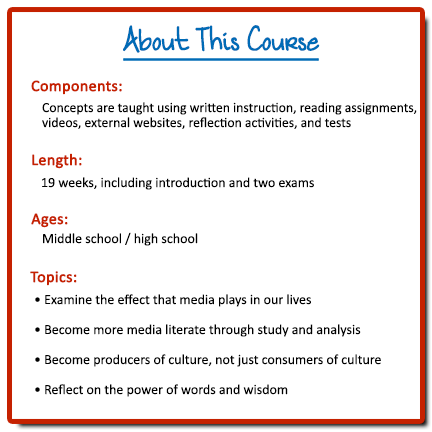 We found the Media Socialization course to be a perfect way to spend extra school time; the discussion sheets and comprehension questions were well-presented and gave us lots to talk about regarding our faith, the media, and how popular culture has influenced and been reflected in both. The variety was something I had never seen in other online resource sites, and it was presented from a Christian perspective with a very agreeable theology. The ability to know just how many and what kind of credits a course will qualify for was made easy with the transcript tools for each course, and I could start any course at any time of year by starting at the beginning and working through at our own pace. There is even access to archives, so if you want the course to be more intense, or you wish to make it a 12-month course, you can. It was perfect for the mother who loves the idea of planning (like me) but has a difficult time actually implementing the creation of lesson plans. I could simply access the course the week or even day before my child was to do the lesson, and print off all the course materials, including the answer sheet. Each course's objectives were clearly outlined so you know what to expect (see below)! For the parent who doesn't know where to start, or just needs to keep trucking through a difficult time in their school life with little to no planning (perhaps during the birth of a baby? ), the Dailies resource is perfect. With over 25 categories of learning for BOTH parents and students, you can simply click on the Dailies subject of your choosing and follow that day's lesson plan for a complete activity that satisfies many of the core subjects and common "extras" homeschoolers like to study. K-5: Ditch the Desk gives weekly and monthly unit studies for elementary students that takes them away from the "Worksheet" and puts them in hands-on learning situations that are fun for teachers and students. Some of the units are seasonal, but all are listed in the directory, so you can choose which ones to work on first. Will you pick Birds, Candy Canes, or Growing up Dutch to start with? Joy in the Morning is a weekly devotional series with a message for moms who are in the thick of child-rearing, homeschooling, and life in general. Everyday Astronomy gives little learners a fascinating look at the skies with crafts, lessons, recipes, and stories to keep studies fresh and interest in science at an all-time high! We personally really like the Copywork Daily, which has the same text for both print and manuscript students. It lets all of my kids work together on one piece of literature at their own grade levels! As with any resource that is bursting with possibilities, it can be a little overwhelming to know where to start and not feel like you have to do everything right away. As much as we come to new resources with good intentions, I came to my membership to The Old Schoolhouse's SchoolhouseTeachers.com with a mission to pick up 3-4 new subjects for our school. If you are going to start using it for more than one student, I would recommend going slow, getting to know the site very well, and choosing one course to start with per week, until you get up to the number of courses you want to implement. Keep in mind that much of the content you will want to access is actually listed in the Archives, as well. Access to the limited version with AppleCore Silver is just $14.95 a month -- or get a discount when you buy a year for $139. If you want the most for your money, however, I recommend the ultimate membership, which includes gold Applecore membership and a few more course options. The annual membership of the ultimate is the best savings with a Buy One Year, Get One Year for the same price as the annual limited. What a deal! Wanna try before you buy? Use the coupon code LIMTRIAL on the Limited Monthly Membership or the code TRIAL on Ultimate Monthly Membership and enjoy all the courses and membership resources for 30 days for just $5 (trial code cannot be combined with other codes). As I had mentioned before, I was a member of the site before this review and had been using it successfully for my highschooler to supplement and fill in the gaps of a boxed curriculum. I believe that you can use it as a sole curriculum solution, although we like the variety of using several different curriculum vendors and keep it as an extra tool in our eclectic tool belt. And with extras for teachers, such as printable planners, menu plans, and exclusive discounts, it really can't be beat on the value. Plus, you don't have to buy any extra textbooks, although there are opportunities to coordinate courses with supplemental reading materials, if you choose. It's not mandatory, though. For the family on a budget, it's really a solid choice.